Cameras on the Canadarm2 robotic arm monitored the SpaceX Dragon resupply ship as it departed the space station Saturday morning. 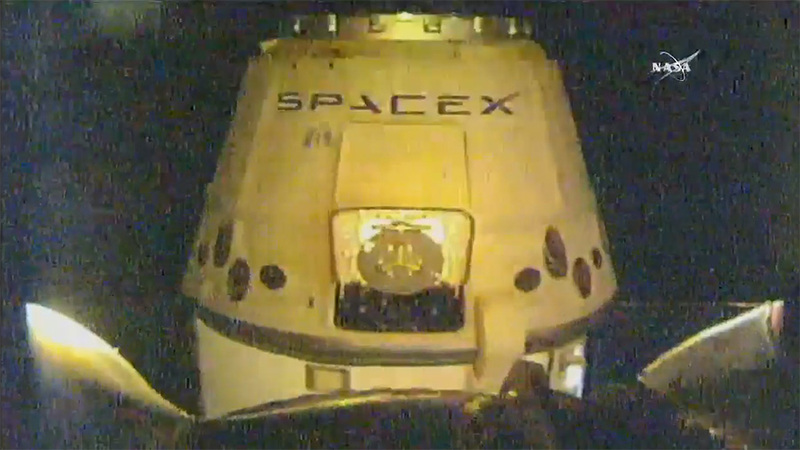 Robotic flight controllers released the SpaceX Dragon cargo spacecraft from the International Space Station’s robotic arm at 9:23 a.m. EDT, and Expedition 55 Flight Engineer Scott Tingle of NASA is monitoring its departure. Dragon’s thrusters will be fired to move the spacecraft a safe distance from the station before SpaceX flight controllers in Hawthorne, California, command its deorbit burn about 2:06 p.m. The capsule will splashdown about 3 p.m. in the Pacific Ocean, where recovery forces will retrieve the capsule and its more than 4,000 pounds of cargo, including a variety of technological and biological studies. The deorbit burn and splashdown will not be broadcast on NASA TV. Dragon is the only space station resupply spacecraft currently capable of returning cargo to Earth, and this was the second trip to the orbiting laboratory for this spacecraft, which completed its first mission nearly two years ago. SpaceX launched its 14th NASA-contracted commercial resupply mission to the station April 2 from Space Launch Complex 40 from Cape Canaveral Air Force Station in Florida on a Falcon 9 rocket that also previously launched its 12th NASA-contracted commercial resupply mission to the station.